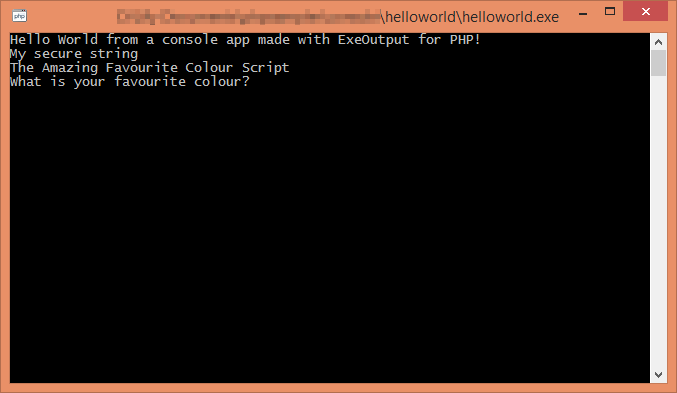 ExeOutput for PHP can create console applications with no GUI. These applications work as if PHP was run in CLI mode. ExeOutput for PHP creates a single and stand-alone executable file: end users just launch the resulting EXE file. No PHP installation is required. All compiled files are automatically fed into the PHP runtime when requested. By default, the index page script is executed at startup. You can define another command line in the PHP Settings => Main Setting page. A console application cannot prompt for elevated rights: use an administrator command prompt to complete administrative tasks. exo_get_resstring can be used to protect resource strings. Do not use $_SERVER['DOCUMENT_ROOT'] because the $_SERVER variable is empty in a console application (not running on a server and it is not processing an HTTP request). The following code was used to render the console app whose screenshot is available above.